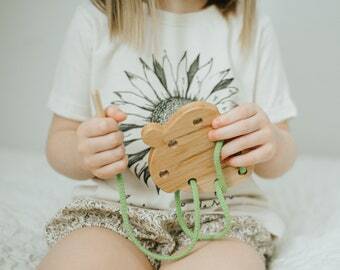 Lacing card toys make great gifts for kids! 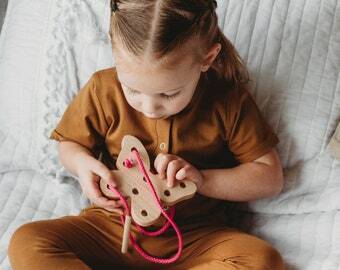 A rabbit (Easter Bunny) shaped lacing toy is a fun way to bring festive fun and learning for the toddlers in your life! Designed for small hands and build to last! My lacing boards help children with their fine motor skills, hand eye coordination and build longer attention spans. They make great on the go activities for waiting times like doctor's offices and waiting for a plane to board. Made from solid maple wood - each one is cut by hand! This bunny is 6 1/4" tall, 4" wide and 1/2" thick. 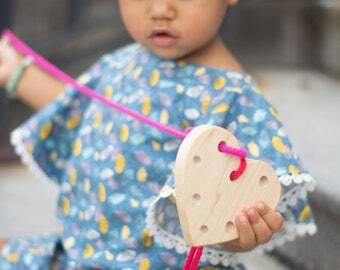 Each one comes with a hand dyed cotton cord with a wooden needle attached. They are finished with a beeswax polish. Beautiful craftsmanship and very prompt shipping! Thank you. So cute, and well-packaged too. Thank you!